29/04/11 -- Soybeans: May 11 soybeans closed at USD13.92 3/4, up 42 1/2 cents; Nov 11 beans closed at USD13.74 1/4, up 36 1/2 cents; May 11 soybean meal closed at USD358.10, up USD9.40; May 11 soybean oil closed at 58.13, up 170 points. Beans were up 12 1/4c on the week, with meal down 70c and oil down 14 points. Midday weather forecasts calling for cooler and wetter condition to return over the weekend was enough to reverse yesterday's losses and then some. Whilst corn plantings lag though, there is always the possibility of more soybean acres to come. Corn: May 11 corn closed at USD7.54, up 31 cents; Dec 11 corn closed at USD6.69 1/2, up 32 cents. Old crop May was up 16 3/4 at the end of a choppy week, with new crop Dec climbing a more modest 4c. Conflicting weather forecasts throughout the week have been behind the volatility. Today's storyline was cold and damp with night lows in the 30s F for northern areas of the corn belt. "US corn producers typically plant around 55% of corn between April 20 and May 12 and are usually finishing up by May 20. This year they hope to boost corn plantings by 5%, yet only 9% of corn was seeded by April 24 due to adverse weather," point out Martell Crop Projections. Wheat: May 11 CBOT wheat closed at USD7.69 1/4, up 26 1/4 cents; May 11 KCBT wheat closed at USD8.93, up 22 3/4 cents; May 11 MGEX wheat closed at USD9.45 1/4, up 28 1/2 cents. Chicago wheat fell 30 1/4c on the week, with Kansas losing 39 1/2c and Minneapolis down 6 1/4c. 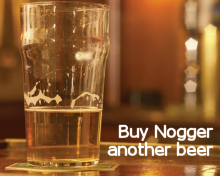 It's the same old story, to dry in the south and too cold and wet in the north. 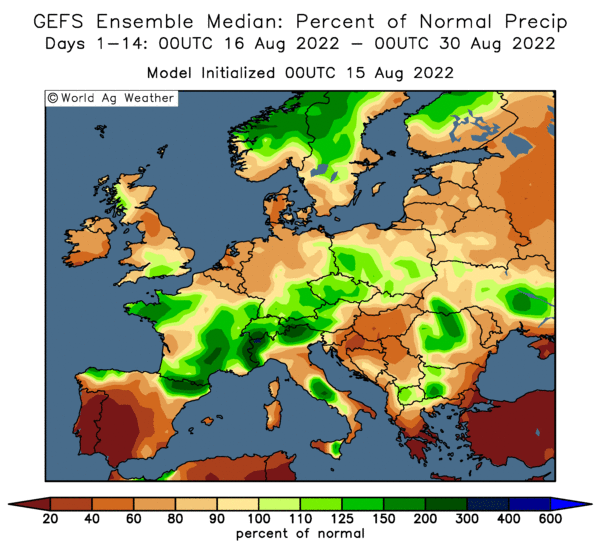 The European weather outlook has improved a little, Russian plantings are getting going after a slow start and Ukraine sowings are more or less complete. Asia has been buying feed wheat, most likely of Australian origin, although some Pakistani wheat has also been sold into that area. 29/04/11 -- London trading was closed for the royal wedding, although trade continued as normal across the Channel. May Paris wheat closed up EUR4.00/tonne at EUR244.50/tonne whilst Nov was EUR5.00/tonne higher to EUR215.75/tonne. 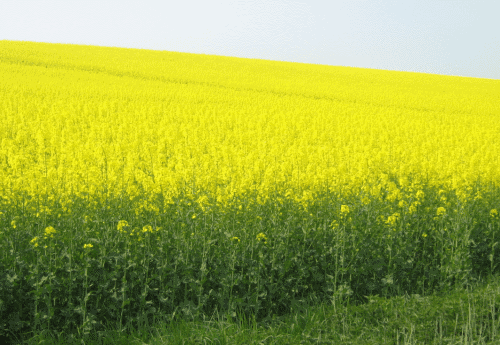 Expiring May rapeseed crashed EUR/17.25tonne to EUR452.25/tonne, although other months were only down nominal amounts. The pound and euro both remain close to 17-month highs against the dollar set earlier in the week, capping gains. Spotty rains continue to fall across parts of France, Germany and the UK. I can personally vouch for the latter, the windscreen wipers were required (and at some points not on intermittent either!) on a trip to the east coast today. A drought-buster however it unfortunately wasn't. The radar is currently showing heavier and more concentrated rainfall building across northern France in late afternoon (click image to enlarge). Some of these rains may make it across the Channel overnight to affect the south and SW of England in the morning. For the rest of us further north and east it looks like we will have to wait for another day for our next rainfall opportunity forecast to come in the second half of next week. Brussels announced 272,000 MT of soft wheat export licences have been issued this past week, bringing the marketing year-to-date total to 16.5 MMT, 12% up on this time last year. Pakistan has started selling it's new crop wheat harvest, booking deals with Malaysia, Asia and the Middle East. South Korea have also been active this week buying feed wheat and Jordan buying milling wheat. Saudi Arabia is also said to have bought 900,000 MT of barley earlier in the week. 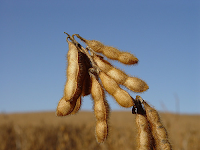 May 11 soybean meal closed at USD348.70, down USD8.00; May 11 soybean oil closed at 56.43, down 143 points. 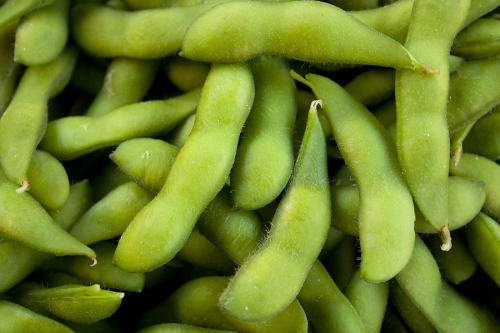 The soy complex closed sharply lower on improved weather prospects and month-end selling, with the funds estimated to have lightened their length by around 10,000 soybean contracts on the day. Weekly soybean export sales of 143,500 MT old crop and 55,700 MT new crop made combined sales of 199,200 MT versus trade ideas of 350-550,000 MT. That was a three year low for old crop sales for this particular week. Corn: May 11 corn closed at USD7.23, down 29 1/4 cents; Dec 11 corn closed at USD6.37 1/2, down 29 3/4 cents. Corn hit limit down and closed at, or very close to, that point on the back of better planting prospects in the western corn belt and stop-loss selling, driving May to close at its lowest levels this month. July and September ended limit down, with July also at monthly lows. Weekly export sales were dismal at 349,000 MT of old crop and just 94,700 MT of new crop, make a combined 443,700 MT - well below expectations for sales of 800,000 MT - 1 MMT. That's the worst combined total of 2011 so far, and the lowest old crop sales volume since mid-October. Wheat: May 11 CBOT wheat closed at USD7.43, down 34 cents; May 11 KCBT wheat closed at USD8.70 1/4, down 42 1/4 cents; May 11 MGEX wheat closed at USD9.16 3/4, down 30 3/4 cents. Wheat export sales were the only ones not to disappoint today, coming in at a combined 418,200 MT against trade expectations of 350-550,000 MT. Even so spillover weakness from corn dragged wheat sharply lower on the day too. An improved weather outlook for Kansas saw wheat there end around 38-43c lower. Even so crop conditions are still mixed at best. The weak dollar will help US wheat retain it's competitive edge, with exports and sales running at their best levels for the past two years. 28/04/11 -- May London wheat closed GBP2.10/tonne lower at GBP205.00/tonne with new crop Nov down GBP4.95 to GBP169.65/tonne. May Paris wheat fell EUR5.25/tonne to EUR240.50/tonne whilst Nov was EUR9.25/tonne lower to EUR210.75/tonne. Grains tumbled sharply on a combination of factors including both the pound and euro hitting or threatening to break through 17-month highs against the dollar after the US Fed chairman last night said that US interest rates are set to remain low "for an extended period." Some rain relief for France and Germany also helped, as did forecasts for some of that precipitation to reach the SE of England tomorrow. The weather outlook is also improving in the US, with forecasts for rain and cooler temperatures in Kansas, and a drier fortnight ahead for the wet corn belt further north. CBOT corn hit limit down at one point late in the day on the back of these revised forecasts. The US agricultural attaché projects all wheat production in the EU-27 at 141.3 MMT this year, which is up 4% from the 135.8 MMT harvested last year. Barley production is seen at 54.5 MMT, compared with 53.0 MMT in the previous year, and corn output at 59.3 MMT versus 55.5 MMT in 2010. Confidence seems to be growing of a decent crop in Ukraine this year, with the Ministry there raising their 2011 grain crop estimate to "up to 45 MMT" from 42-43 MMT previously. Total grain exports are seen rising from 13.5 MMT in 2010/11 to 19-20 MMT in 2011/12, which would be second only to the bumper record season of 2008/09. 28/04/11 -- The overnight grains closed mixed with beans around 5-8c higher, corn up 3c on old crop to down 5c on new crop and wheat 3-4c easier. The dollar is lower following last night's indication from the Fed that interest rates at an effective zero are to stay for some time yet. Weather forecasts are just a little more conducive for a drying out phase in the corn belt, hence a slight weakening of new crop corn. Old crop remains steady on stocks tightness. Weekly export sales for corn were disappointing at 349,000 MT of old crop and just 94,700 MT of new crop. That's the worst combined total of 2011 so far, and the lowest old crop sales volume since mid-October. Soybean sales also came in below expectations at a combined 199,200 MT, whilst wheat sales were in line with trade ideas at 418,200 MT against expectations of 350-550,000 MT. China bought just one cargo of US beans this week - 55,500 MT of new crop. I'm just starting to get a little uneasy about China. Firstly, there's been no confirmation at all of the widely-touted recent US corn sales to them. Secondly, they've now actually said that they intend to limit corn usage for industrial purposes. And thirdly, their "insatiable" demand for commodities is showing signs of having in fact been satisfied as imports slow. There's talk of restrictions on corn usage for non-food purposes also being extended into soybeans too. Some estimates now peg China's soybean imports this year at around 53-54 MMT compared to the USDA's 57 MMT, that would be the first season that we've seen a year-on-year decline in imports since 2003/04. As they continue to wrestle with inflation and a housing bubble, there's also talk of another Chinese interest rate rise looming over the weekend. The booming Chinese economy has been the saviour of the commodities markets over the past three years since the slump of 2008, being almost single-handedly responsible for getting the show back on the road. What happens if the engine has seized? 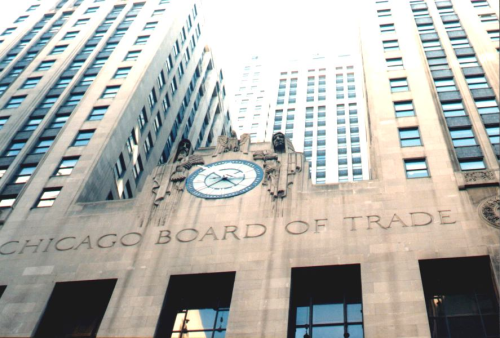 Early calls for this afternoon's CBOT session: beans up 6-8c, corn up 2-4c, wheat down 2-4c. Wheat sales of 265,000 MT for the 2010/11 marketing year and 153,200 MT for delivery in 2011/2012 gives us combined sales of 418,200 MT against trade expectations of 350-550,000 MT. Corn sales of 349,000 MT of old crop and just 94,700 MT of new crop make a combined 443,700 MT, well below expectations for sales of 800,000 MT - 1 MMT. Soybean sales of 143,500 MT of old crop and 55,700 MT made combined sales of 199,200 MT versus trade ideas of 350-550,000 MT. Corn and wheat shipments were decent at 907,800 MT and 826,200 MT, but soybean shipments lagged at 270,300 MT. 28/04/11 -- Just in case you're wondering, as I was/am, there's no mention of London wheat being closed tomorrow on the auspicious occasion of the Royal Welding on the Liffe/NYSE website. I'm surprised that US markets will be open I have to say, as they are probably more interested in the proceedings than we are. 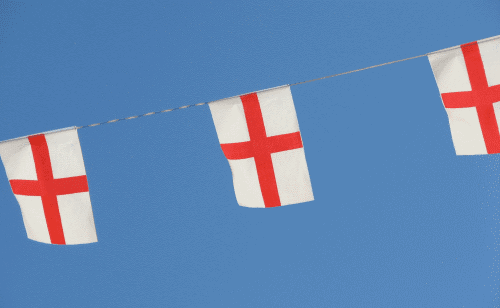 They'll be hanging the bunting out in East Anglia if the forecast rains arrive that's for sure. 28/04/11 -- The pound has hit a fresh 17-month high against the dollar this morning, peaking at 1.6745 before falling back a little on profit-taking. Can it break through 1.70? It hasn't spent any length of time above that level since October 2008. At 1.4880, the euro is also setting it's sights on breaking through 1.50 to test it's own 17-month highs of 1.5140, a break above that level would see the single currency trading at it's best levels since August 2008. We're clearly looking at dollar weakness here, and last night's comments by Fed chairman Ben Bernanke that the labour market there was in a "very, very deep hole" and that it intends to keep interest rates low "for an extended period" seem to indicate a loose fiscal policy for some time to come. That could mean the US dollar becoming the new whipping boy in the forex market for the remainder of 2011. The overnight grains are higher on the back of that sentiment, with beans up around 10c, corn is 6-8c firmer on old crop and 2-4c higher on new crop. Wheat is trading around 2-4c firmer. The bulls remain firmly in control, having scant regard for downside potential. US and Canadian spring plantings of soybeans, corn, rapeseed and wheat are behind schedule. There is talk now that if price rationing hasn't kicked in for USD8.00/bu corn then maybe it will take USD10.00/bu corn to do the trick? Stocks are tight, new crop is going to be late, demand is strong. Let's buy, buy, buy. This thing can only go one way. Yet wasn't everyone saying that in 2008 also? Corn plantings were late in that year too, delayed by cold and wet conditions, yet US yields ultimately finished up the second highest on record at the time. Back then the Dec08 corn future went from just under USD5.00/bu at the start of the year to a high of almost USD8.00/bu in late June, before tumbling to under USD3.00/bu in early December. This year we've seen Dec11 corn start the year at USD5.00/bu and hit a high for the year so far of almost USD7.00/bu, with USD8.00/bu looking highly achievable by June as things stand at the moment. Now let's make this clear, I'm not sat here forecasting that corn prices will be USD3.00/bu by Christmas. 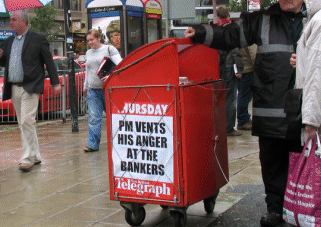 In 2008 we had the sub-prime led financial meltdown in world markets didn't we? There's not likely to be any nasty surprises like that coming our way this time round surely? The point is though that in June 2008 the market perceived that corn was worth almost USD8.00/bu and by December that notion had changed dramatically. The "financial crisis" didn't actually lead to more corn being produced, OR much less being consumed to radically change the supply/demand fundamentals. For what it's worth the USDA pegged corn usage from the ethanol sector at 4 billion bushels in June 2008, and despite the price of crude oil falling out of bed in the second half of the year it was still 4 billion in the November report of that year. What had changed though was that the "smart money" got out. Is it different this time? Is the smart money really here to stay for the long haul? Or could something get them spooked again? We've already had earthquakes, tsunami's, unrest in North Africa and the Middle East to test their resolve. China's oft-quoted "insatiable" demand for commodities couldn't be about to take a serious hit could it? That particular juggernaut has largely been responsible for dragging us all out of the recession perhaps a lot quicker than many had imagined. 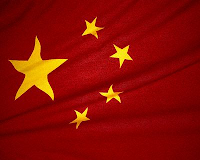 Some believe that it might: Is the Chinese bandwagon about to blow a tyre? 27/04/11 -- Soybeans: May 11 soybeans closed at USD13.78, down 4 3/4 cents; Nov 11 soybeans closed at USD13.768 1/2, down 6 1/4 cents; May 11 soybean meal closed at USD356.70, down USD3.10; May 11 soybean oil closed at 57.86, down 19 points. The market needs a bit of direction. Corn planting delays are potentially bearish for soybeans, but weather forecasts are turning warmer and drier. Chinese buying is shrinking a little, and another interest rate rise - or at least a further increase in bank reserve requirements - could be on the cards again within the next few days. Harvesting in South America is well advanced with less than 10% of Brazil's crop left to bring in. Corn: May 11 corn closed at USD7.52 1/4, down 14 cents; Dec 11 corn closed at USD6.67 1/4, down 8 1/2 cents. The market was nervous ahead of the Fed policy meeting report this afternoon. 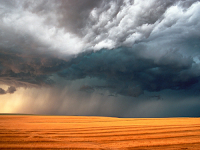 US weather forecasts are mixed, with some predicting warmer and drier conditions for the Midwest, whilst others say that wet and cold is the continuing theme. Funds sold an estimated 15,000 contracts ahead of Bernanke's speech. Weekly export sales, due to be reported by the USDA tomorrow, are expected to show another robust week for US corn with totals in the region of 800 TMT - 1 MMT. Wheat: May 11 CBOT wheat closed at USD7.77, down 34 1/4 cents; May 11 KCBT wheat closed at USD9.12 1/2, down 37 13/4 cents; May 11 MGEX wheat closed at USD9.47 1/2, down 26 cents. Tomorrow's weekly export sales are expected to be around 350-550 TMT. Funds sold around 6,000 lots. Rains in the forecast for Kansas, a slight improvement for conditions in Europe and China and uncertainty ahead of this afternoon's Fed comments were enough to encourage some money getting taken off the table. Private Exporters announced the sale of 100,000 MT of HRW wheat to unknown. 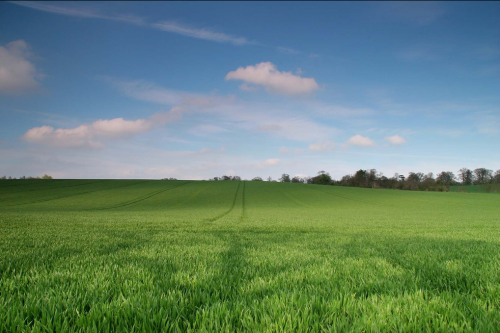 27/04/11 -- EU grains closed sharply lower across the board with May London wheat down GBP4.90/tonne to GBP207.10/tonne and with new crop Nov falling GBP5.40/tonne to GBP174.60/tonne. May Paris wheat fell EUR7.75/tonne to EUR245.75/tonne and Nov was EUR9.00/tonne lower to EUR220.00/tonne. Paris corn, rapeseed and malting barley also declined. Germany got some fairly widespread rains today, which are moving slowly east and expected to hit the SE of England on Friday. Whilst not the torrential downpour that many would have liked, localised falls were reported to be quite heavy in places. In the US the weather has also taken a turn for the better, with much-needed rain and cooler temperatures on the cards for Kansas. Some forecasts also indicate a possible drying out period ahead for the soaked northern Plains too. The US markets were weak ahead of a "groundbreaking" news conference by Fed chairman Ben Bernanke later in the afternoon. That is also keeping the dollar weak, as the market anticipates the US continuing with a fairly loose fiscal policy relative to Europe's. That saw the euro set a fresh 16-month high against the US dollar and the pound hover around 1.6550 for most of the day, close to it's own 16-month high set late last week. That obviously gives US wheat the upper hand when it comes to export competitiveness. Conflicting reports continue to come out of Russia regarding the potential timing of a lifting of the existing export embargo. Gossip emerging from Ukraine suggests that a fairly imminent lifting of their grain export ban, at least for corn, isn't too far away. 27/04/11 -- It couldn't be could it? 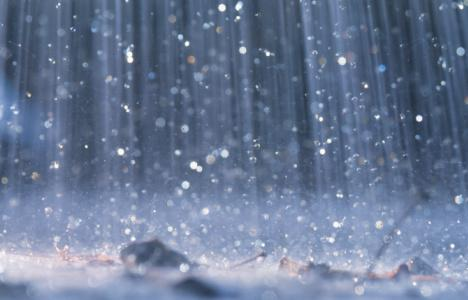 Rain, here in Britain, the very idea. On the one day that we hoped would be sunny too. Sorry William and Kate, you genuinely do seem like a nice couple as well, but I'm afraid it looks like they might be dancing in the streets of East Anglia on Friday, and it won't be royal wedding joy that will be responsible. Where did I put that mac? WARNING: Amounts may vary, always read the label. Never leave a small child home alone with a box of matches, a can of petrol and a Rottweiler who hasn't been fed for a month whist you go out dancing in the rain. Future events are impossible to predict, so this may or may not happen. 27/04/11 -- Latest guide prices for EU rapemeal. 27/04/11 -- Sometimes it's the simplest ideas that are the best isn't it? China has just announced tough new measures to halt the increase in corn usage for "non-feed products" such as ethanol and starch. They're going to start by cancelling tax breaks for corn processors to limit their expansion and ordering banks to stop lending to them. In addition they say that they are going to "limit" corn starch projects with processing capacity of less than 300,000 MT/year and "eliminate" those projects with annual capacity of less than 100,000 MT. These industries are estimated to use around 50 MMT of corn per annum, around a third of the nation's production. America and Europe take note. 26/04/11 -- Soybeans: May 11 soybeans closed at USD13.82 3/4, down 6 3/4 cents; Nov 11 soybeans closed at USD13.74 3/4, down 7 3/4 cents; May 11 soybean meal closed at USD359.80, down USD1.30; May 11 soybean oil closed at 58.05, down 16 points. The market is looking at the weather and thinking that with corn plantings at only 9% done, surely that is going to mean more soybean acres in 2011 for the US. Meanwhile the possibility of further Chinese fiscal tightening as early as next weekend could be on the cards, and soybean demand from that quarter does finally appear to be slowing. Corn: May 11 corn closed at USD7.66 1/4, up 3 3/4 cents; Dec 11 corn closed at USD6.75 3/4, down 5 3/4 cents. US plantings remain well behind normal pace at just 9% done, compared with 23% on the five year average and 46% a year ago. The trade remains concerned over wet and cold weather in the corn belt delaying plantings, but ultimately may have to ask itself is this a better scenario than last season's dryness? Rain does indeed make grain after all. Some, but certainly not all, forecasters are calling for a drier weather pattern to emerge over the next fortnight, which may help planting progress. Wheat: May 11 CBOT wheat closed at USD8.11 1/4, down 14 3/4 cents; May 11 KCBT wheat closed at USD9.50 1/4, down 10 1/2 cents; May 11 MGEX wheat closed at USD9.73 1/2, down 7 1/4 cents. Stats Canada are forecasting sharply higher spring wheat plantings there at 24.724 million acres. "Kansas wheat areas are finally getting rain late in April with scattered rainfall in the state today and isolated thunderstorms tonight. There is also a possibility of showers in Western Kansas each day Friday-Sunday," say Martell Crop Projections. 26/04/11 -- May London wheat closed GBP2.00/tonne higher at GBP212.00/tonne with new crop Nov up GBP2.60 to GBP180.00/tonne. May Paris wheat was up EUR1.25/tonne at EUR253.50/tonne whilst Nov was EUR4.25/tonne higher to EUR229.00/tonne. There were 62,900 MT of original first day wheat tenders against the May contract in London today, with 43,100 MT of re-tendered wheat, my chums at EuropeanGrain.com tell me. 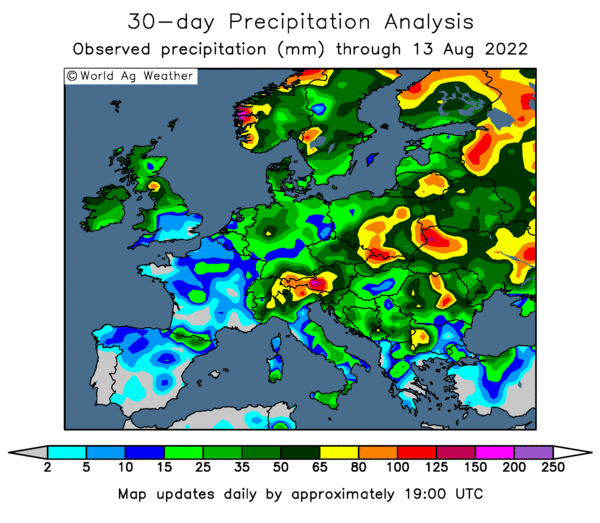 Weekend rains in Europe, such as they were, proved to be fairly scattered across parts of northern France, Germany and Poland leaving crops there already potentially facing yield losses despite the fact that April isn't even out yet. Potentially of more concern is the 14-day forecast for continued dryness. 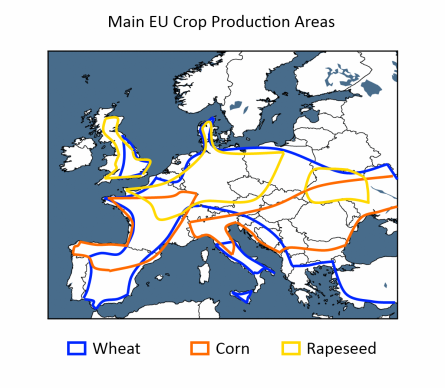 Some crops here in the UK too could also start to suffer possible significant damage by then too. 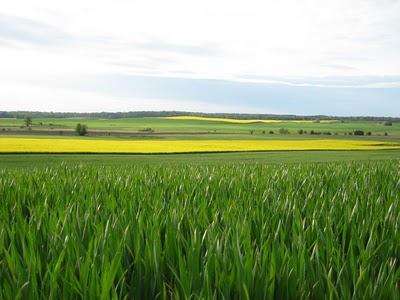 Meanwhile the late arrival of spring for Russian growers means that spring plantings there are well behind schedule, and farmers here you will recall are looking to increase their 2011 sowings to make up for a pretty disastrous autumn campaign. Fast forward across the pond and we find US spring wheat plantings at only 6% complete against 25% normally and 40% of the winter wheat crop rated poor/very poor. On a more optimistic note Canadian farmers are hoping to plant 17% more wheat for the 2011 harvest, according to Stats Canada today. Conditions will have to warm up and dry up considerably, and fairly rapidly too, for that to happen. 26/04/11 -- Sitting at my computer idly wondering how things have changed dramatically in the past six weeks, just after the market collapsed in the aftershock reverberating around following the Japanese earthquake/tsunami (mixed in with a touch of Gaddafi jitters too). Interesting to see Chicago corn closer to the bottom of the list than the top, and also of note is little old London wheat fighting above it's weight again. 26/04/11 -- The overnight grains closed lower with beans down around 8-10c, wheat off a similar amount and corn down 4-6c. Crude oil is flat and so too is the dollar. Saudi Arabia bought 275,000 MT of US/Australian wheat and Iraq 300,000 MT split between the same two origins over the long weekend. Japan is looking for 342,518 MT of wheat this week of which 164,000 MT is US origin. The USDA last night reported corn plantings at only 9% complete, up just two points in a week, and well below the 23% five year average. Spring wheat plantings also lag at 6% against 25% normally and 39% last year. Winter wheat ratings good/excellent fell from 36% to 35% and poor/very poor increased from 38% to 40%. In Oklahoma only 5% of the crop is rated in the top two categories. 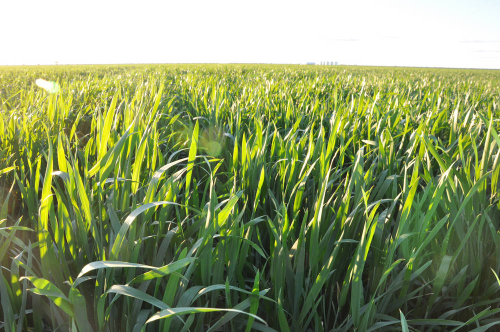 "Wheat producers in North Dakota are looking to begin fieldwork, not seeding, by May 6. It would be the latest date for ground preparation in the decade," say Martell Crop Projections. "Kansas wheat areas are finally getting rain late in April. Showers have produced some useful rain in the past few days, but less than 20% of wheat has benefited from widely scattered showers," they add. 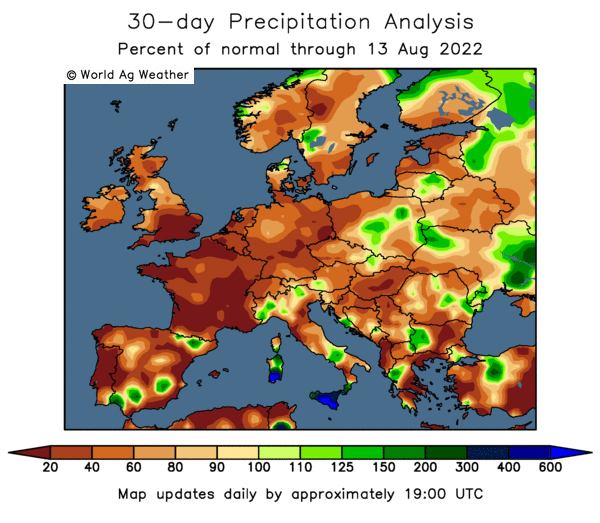 European winter wheat conditions also remain a concern, as too must the slug-like pace of Russian spring plantings, where little more than a million hectares have so far been seeded against a government target of 30 million. 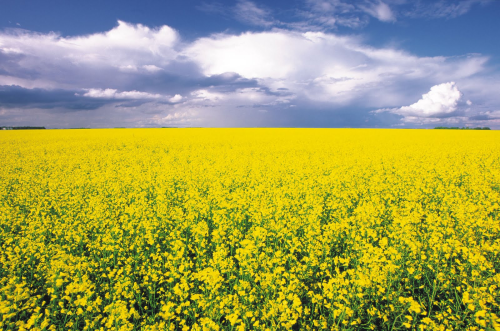 Stats Canada say that Canadian farmers will plant 24.724 million acres of wheat this year, 17.4% up on 2010. Rapeseed plantings are also seen sharply higher - up 14.3%. Celeres say that the Brazilian soybean harvest is 91% complete and in Argentina the Ministry there say it's 52% done. 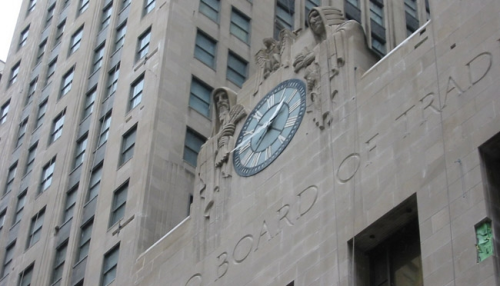 Early calls for this afternoon's CBOT session: corn 4-6c lower, wheat down 6-8c, beans down 8-10c. This Is England, Isn't It? 26/04/11 -- It was an unusually lovely Easter weekend, with Wisley in Surrey hitting a balmy 27.8C, according to the BBC last night. Combined with a dry March and April crops are withering in the ground. At least that's the way the market seems to see it. At the end of the day this is England isn't it, and not North Africa. 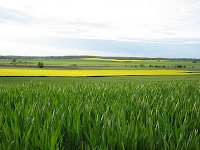 This picture of a field of rapeseed (click to enlarge) here in North Yorkshire taken over the weekend hardly shows a stunted and sparse crop wilting on it's knees. A walk with Nogger's dog this morning (unfortunately sans camera) took me into a field of nearby wheat. This particular walk I only do occasionally on what is far from being prime northern arable land, and the crop also looked surprisingly strong an vigorous. There seems to be a general consensus that another fortnight of no, or only trace amounts of rain really will see some damage done, especially on lighter land and amongst 2nd and later drilled wheat. Unfortunately that is exactly what is in the forecast. It's a pity that they can't bring Wimbledon fortnight forward to the beginning of May, that would sort the job out. New crop Nov London wheat is almost GBP3.00/tonne higher this morning, with Paris wheat around EUR4.00/tonne higher. Partly playing catch-up with Chicago from Friday and Monday night, where the May contract gained 41c, and partly reflecting another dry weekend here. 25/04/11 -- Soybeans: May 11 soybeans closed at USD13.89 1/2, up 9 cents; Nov 11 soybeans were unchanged at USD13.82 1/2; May 11 soybean meal closed at USD361.10, up USD2.30; May 11 soybean oil closed at 58.21, down 6 points. Beans gained from spillover support from corn and wheat. The slow pace of spring corn and wheat plantings in the US could be bearish for soybeans as it may mean that more later planted bean acres get sown. Even so, sharply higher grains dragged beans also higher by the session close. Corn: May 11 corn closed at USD7.62 1/2, up 25 1/4 cents; Dec 11 corn closed at USD6.81 1/2, up 16 cents. "Temperatures in the North Central United States fell 6-10 F below normal last week. This was a setback for spring planting of corn and wheat. Field temperatures in northern Iowa are near 40 F compared to the 50 F threshold for corn germination," said Martell Crop Projections. 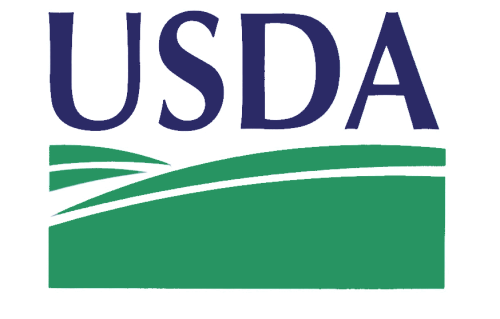 After the close the USDA confirmed that only 9% of the crop was in the ground, only up 2 points in a week, and compared with 46% a year ago and 23% on average. Wheat: May 11 CBOT wheat closed at USD8.26, up 26 1/2 cents; May 11 KCBT wheat closed at USD9.60 3/4, up 28 1/4 cents; May 11 MGEX wheat closed at USD9.80 3/4, up 29 1/4 cents. Nothing much has changed over the weekend, the spring wheat crop is well behind at just 6% planted as opposed to 39% a year ago and 25% on average. Good to excellent conditions of winter wheat fell a point from last week to 35%. "Scattered frost developed both Saturday and Sunday mornings in Kansas, Nebraska and Colorado. Wheat just beginning to head out was not damaged," say Martell Crop Projections.